Like much of the central US, our area has been inundated with higher than normal rainfall. The result is that most of our outdoor projects have been put on hold. It also meant an extended soccer season, which put most of our indoor projects on hold. Over the last couple of weeks, we’ve carefully monitored the level of the river. While our house sits on top of a ridge some 80 or 100 feet above the river bed, we do have a field down there adjacent to the river with hunting equipment and a small boat. A quick drive into town via the dirt roads gives us a pretty solid idea of the river level. Yes, those are tree TOPS touch and partially in the water. And we’re talking big, tall trees along the river bank. That’s also a whole tree floating down the river. 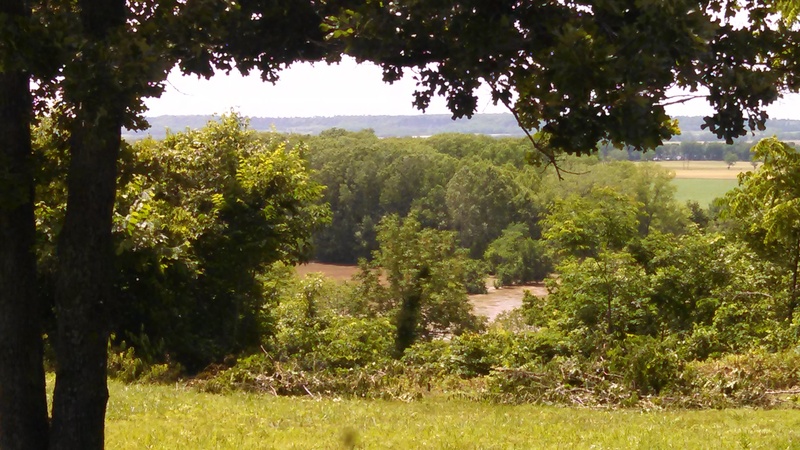 From the house, we can see the water when the river is up, but still in its banks as it was last week. 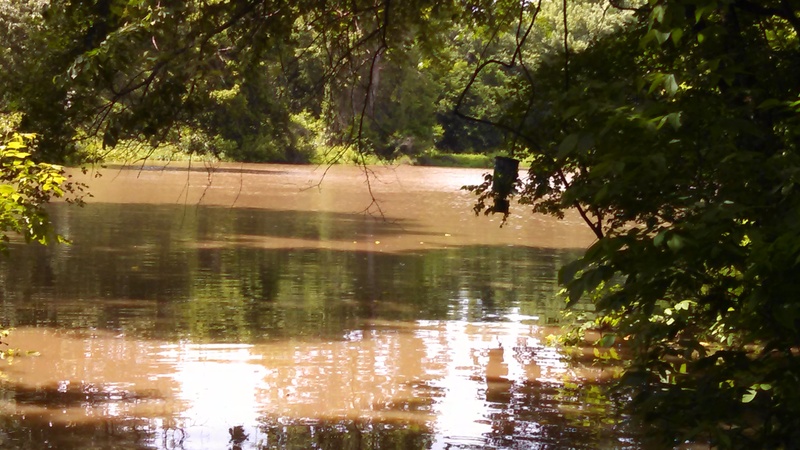 This weekend, the river has run over the banks in many areas near the house, including some crop fields that we can see. That brown stuff on either side of the center tree is water. The left side of that tree is normally a dry crop field. 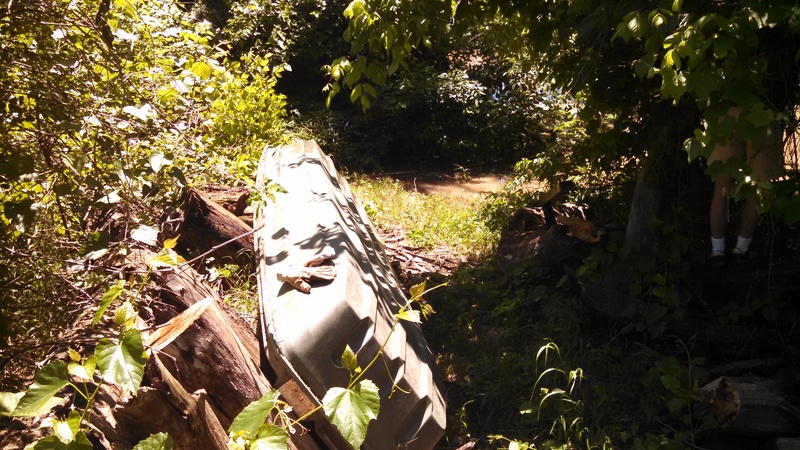 Last week, we went down to the field and pulled the boat out of the creek which was up significantly.We pulled it from the water and tied it to a different tree a little further up. 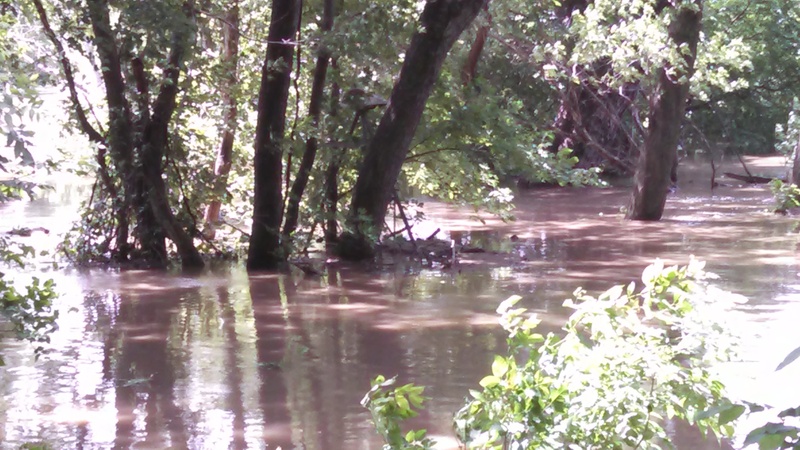 Here’s a view of what is normally a barely trickling creek. A week ago it was about 10 feet wide and at least 10 feet deep. At this point, we cannot even get to the creek. 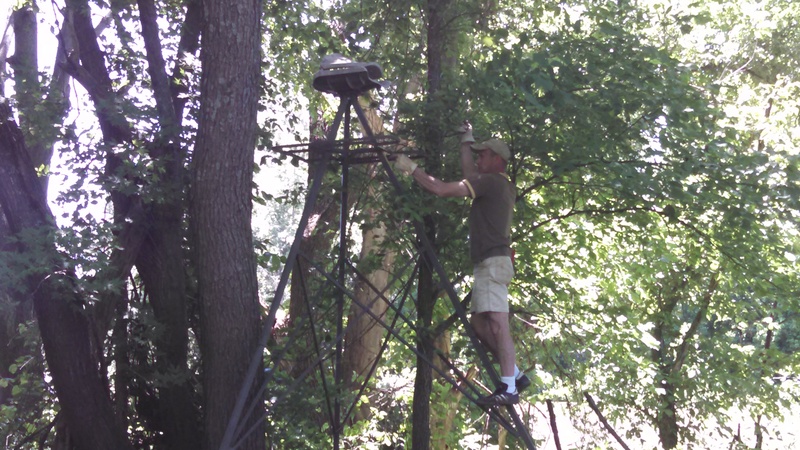 CAT also wired the hunting tripod near the river to a large tree. 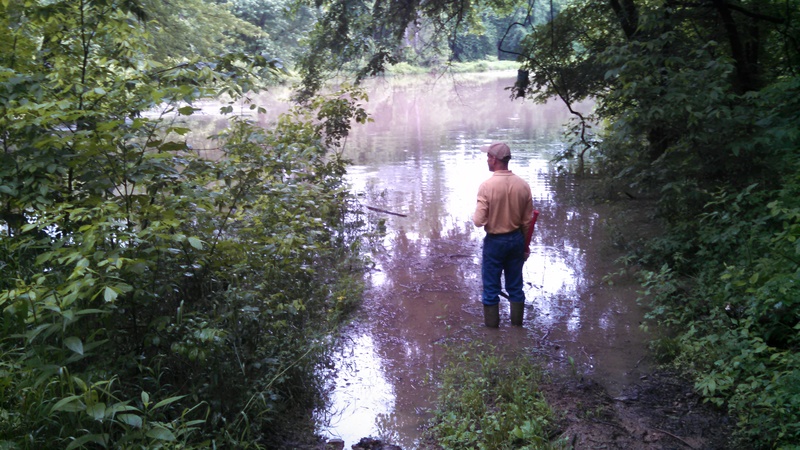 We were discussing putting out some catfish lines in the creek, but, now that the river is up and the field is flooded, we’re are just hoping our little boat is still where we left it. The tripod now has water half-way up the legs, or about where CAT’s feet are in the picture above, if you can pick it out among the trees and debris at the legs. It’s about center in this picture behind the diagonal tree trunk. Here CAT is standing where the end of our field road would be. This is normally still on the downhill slope of the road from the top of the ridge. We didn’t risk walking any further into the water. A day later, the water was up another 2 or 3 feet. Unfortunately, it looks like we are expecting more rain over the next week and the corps are planning to release additional water from upstream. 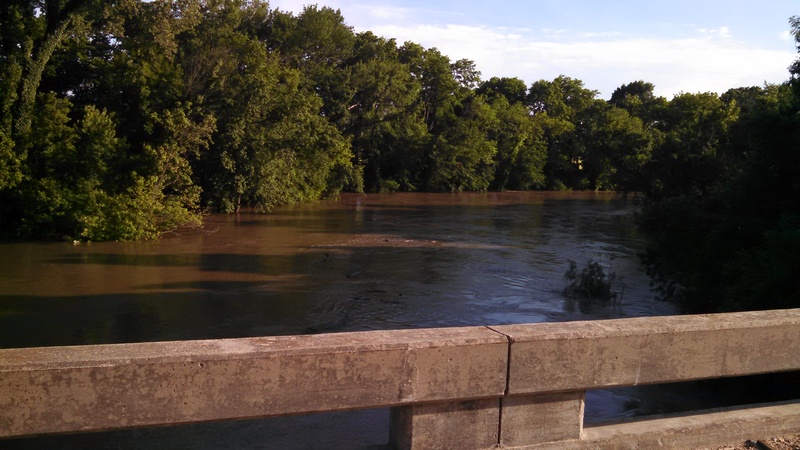 It looks like any field projects or river fishing is out of the question for awhile. Here’s hoping for drier weather soon! 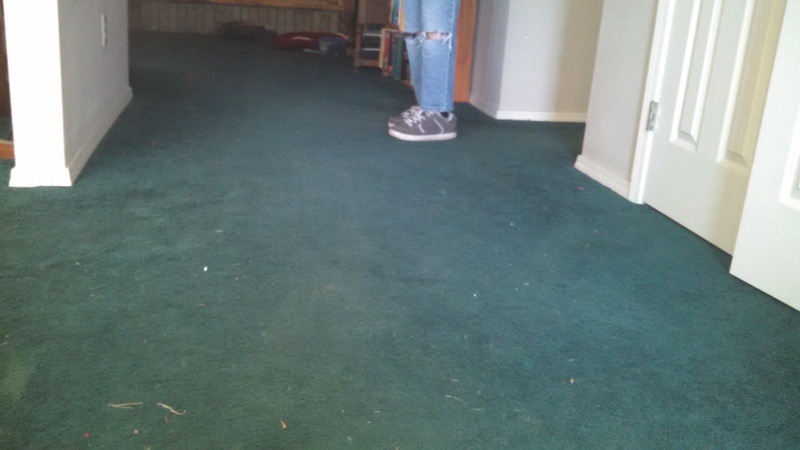 Except for “wet” rooms, the entire house was carpeted. With very green carpet. That is original to house. And is very worn. 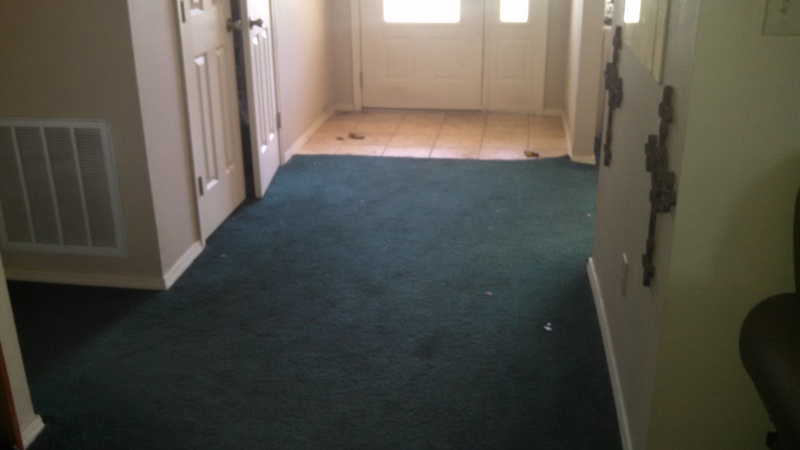 The main concern was the common areas. Between the kids and the dogs, and honestly, my own mucky boots, the floors needed vacuuming every other day, sometimes every day! Who has time for that?!? Not this girl or her amazing husband that vacuums. That was eating up at least 3 hours every week. 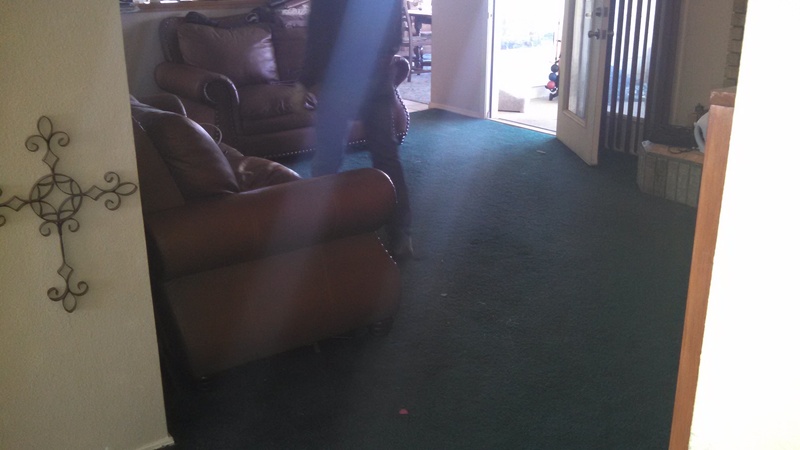 The front entry was a constant battle and had collected many new stains since we moved in. 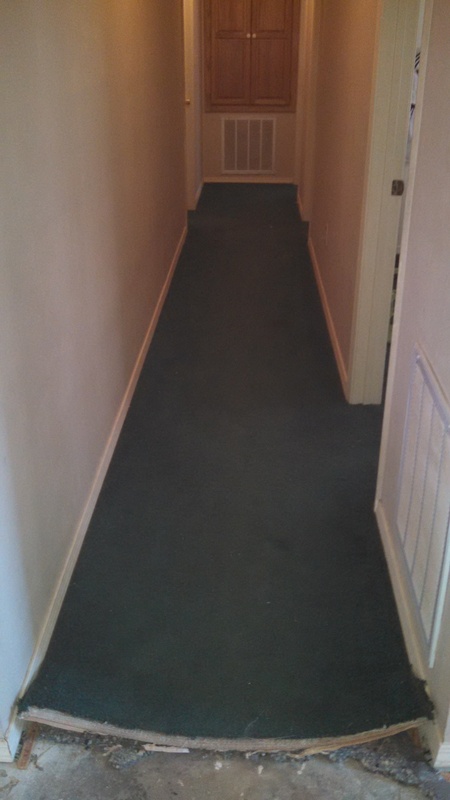 The hallway to the bedrooms had its own share of problems, and the carpet was extremely worn out right down the center, creating a dingy brownish look to the carpet. 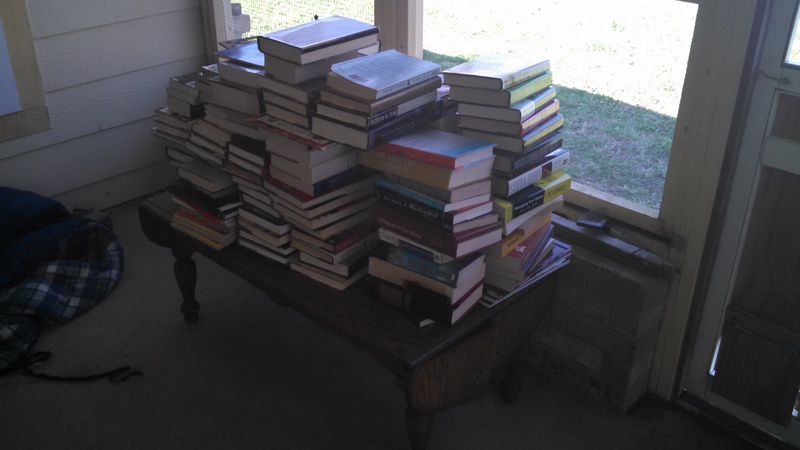 As you can see we have a lot of books in the family room, so we had to move all of those out to the porch temporarily. The kids wanted me to get rid of CAT’s and my books, but they didn’t complain about moving theirs. Go figure. 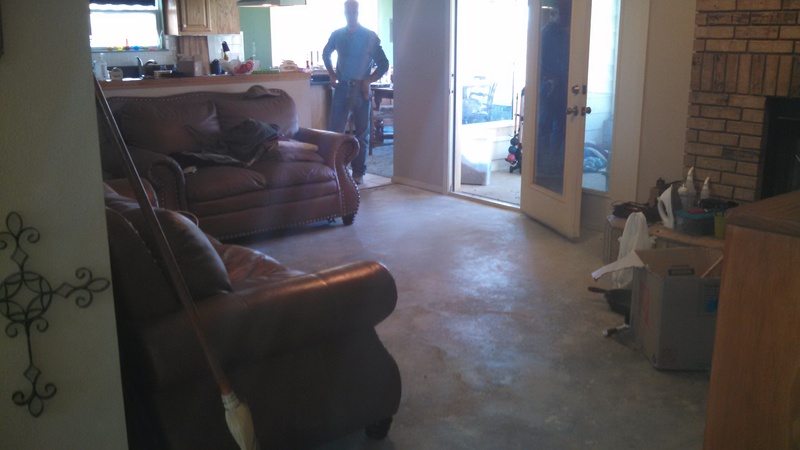 The after effect is a mostly smooth concrete floor. 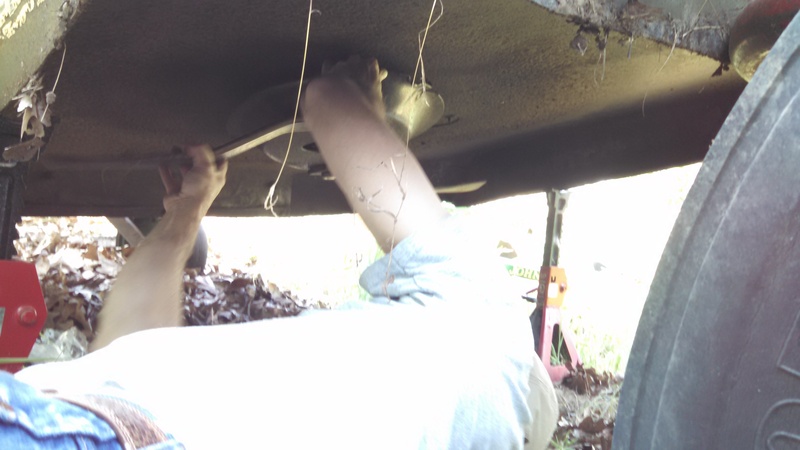 We do have little holes along the edges where we pulled the tack strip up that will need to be filled. 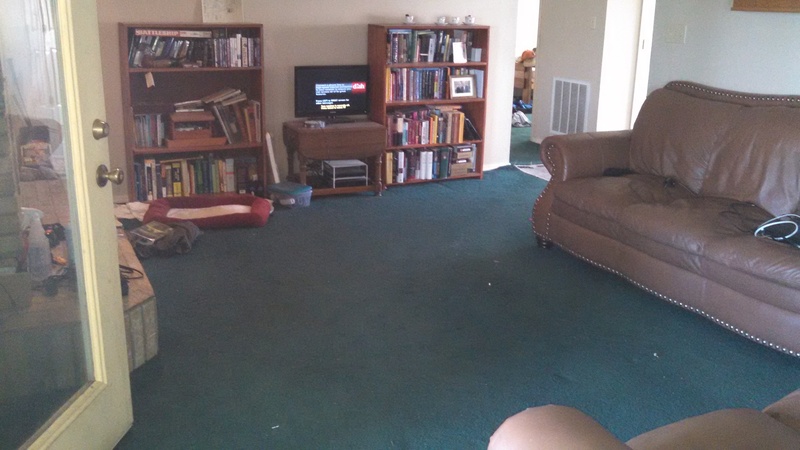 A before and after look from the opposite direction in the family room. Also a look at CAT developing a plan and then surveying the completed work. 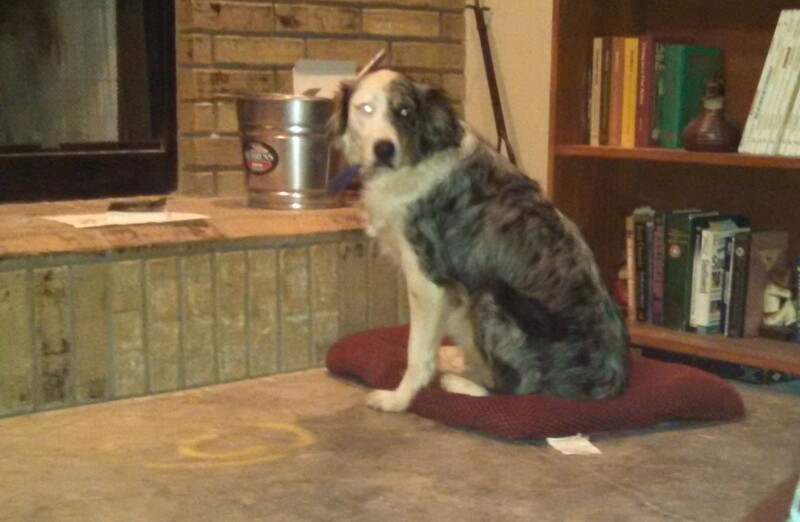 Sophie is demonstrating the heightened appreciation for puppy beds around here, especially during the unusually cool weather we have had to date. Our plan is to eventually put in solid wood floors throughout, though we might rethink that given our affinity for large breed dogs that are inside pets. However, that’s a step for 3 or 5 years from now. We have a few walls to rip out and a kitchen to relocate or at least plan before we can purchase that flooring all at one time. Meanwhile, we are going down to sub-floor level. At least in the rooms with concrete. The plan is to stain the concrete. 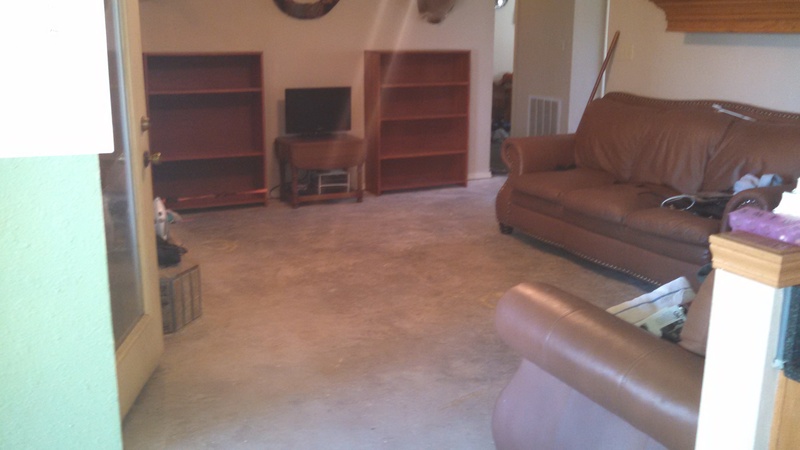 By that, I mean that we are going to hire a contractor to come in do all of that work.That comes after the wall behind the big couch comes out in the next 8 to 12 months. We are still on hold with two other rooms because they are on a wood sub-floor over the basement until we come up with a plan we can execute quickly. One of those is my “office” (aka, the formal living room), the other is the formal dining that is slated to become an enclosed office during remodel. 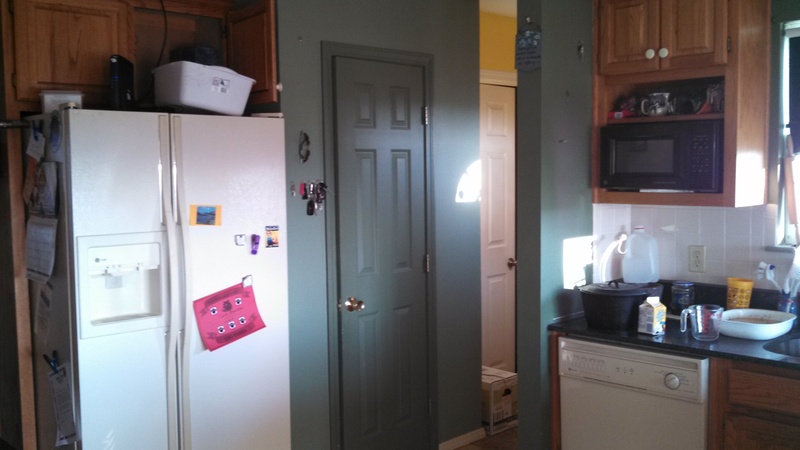 The next undertaking will be the green kitchen and breakfast room walls. While we are considering a (very) washed down version of this color for the exterior of the house, we would prefer a more neutral tone for inside. My hope is that it will make the room seem less dark and more open until we can do the remodel. Spring brings new life to the Ridge. 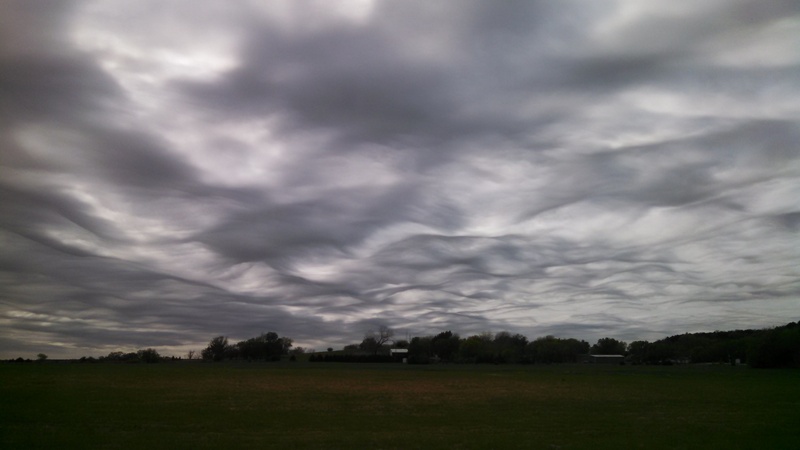 It also brings some pretty dramatic weather. Today, we have had torrential downpours, sunshine, and now cloudy, grey skies. Grasshopper took this photo at bus pickup one day when the clouds were particularly dramatic. It looked as though someone had painted the sky. I’m sitting at the kitchen table today, catching up here and watching my boys work hard. Last year for Mother’s Day, I received a gift that will give for many years: an apple tree, a cherry tree, and a peach tree. This year, my CAT brought me a white peach, another cherry, and a pear tree to add to the orchard. 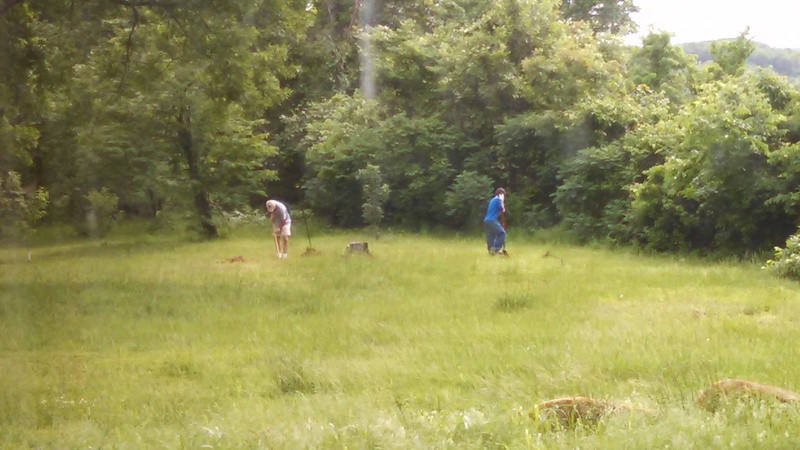 Today, CAT and Grasshopper are digging holes for the new trees, hopefully before the next round of storms hits us. Meanwhile, the rest of our yard has finally sprung, much delayed by significant fluctuations in weather over the last few months. 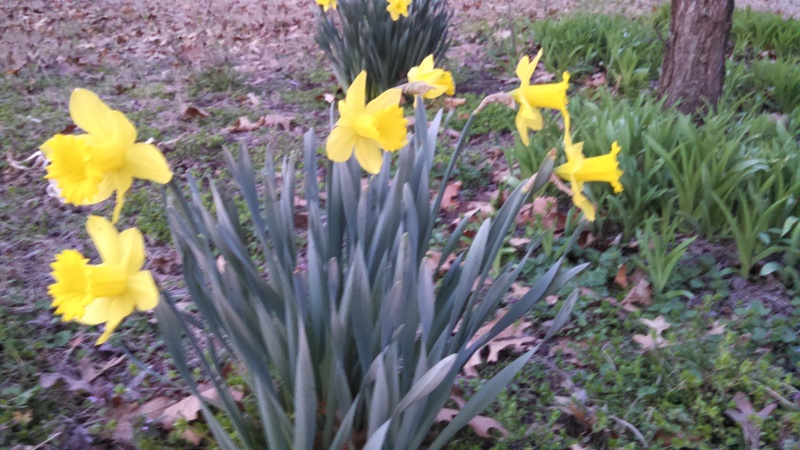 The first signs of Spring around here are the vibrant daffodils. I’m two for two on being out of town when it happens. Last year, we were in Texas and came home to discover them bloomed; this year I was traveling for work. We kick off the season with our annual birthday bash as the first shop party since CAT and I share April as a birth month. The party involves shrimp, Crawfish, Texas style BBQ, friends, and lots of laughs. 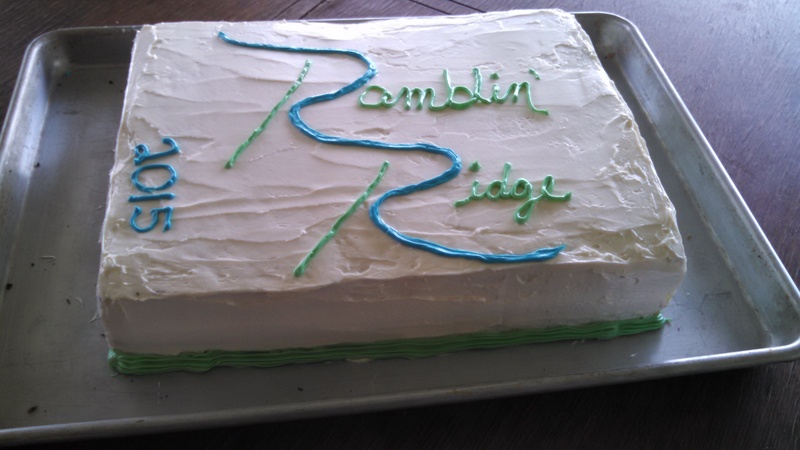 Oh, and cake, of course. Here’s my masterpiece from this year. 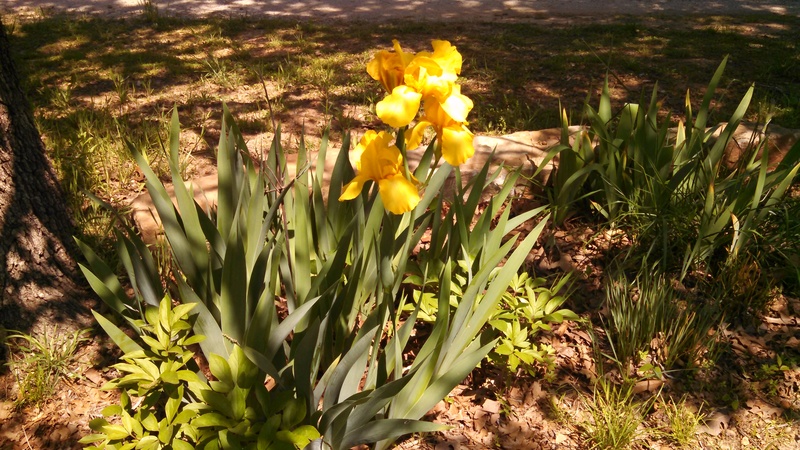 What most people don’t know is that our first spring was full of “surprise” flowers. We had no idea what to expect when we bought the house, other than the previous owner had sporadically planted rather than traditional planned out beds. 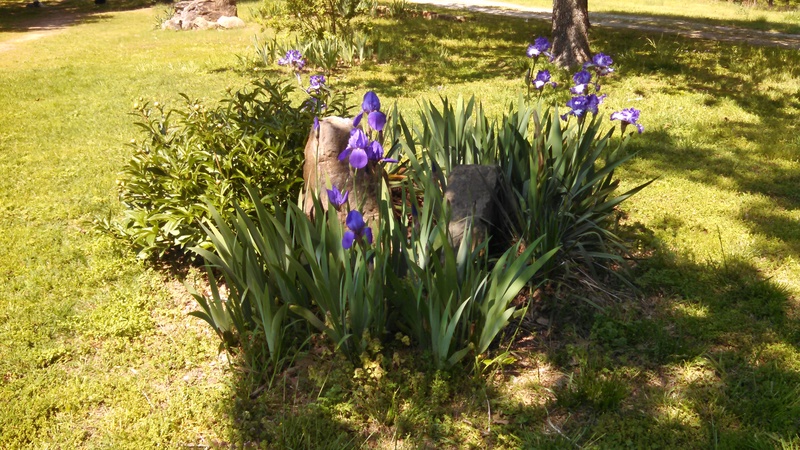 Next come the irises. 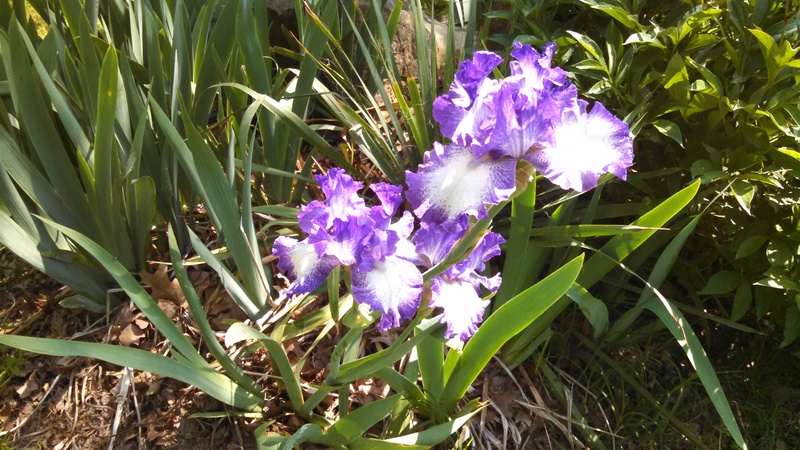 They are planted all over the front yard and we have a plethora of colors–yellow, multiple shades of purple, and purple and white (my favorites). 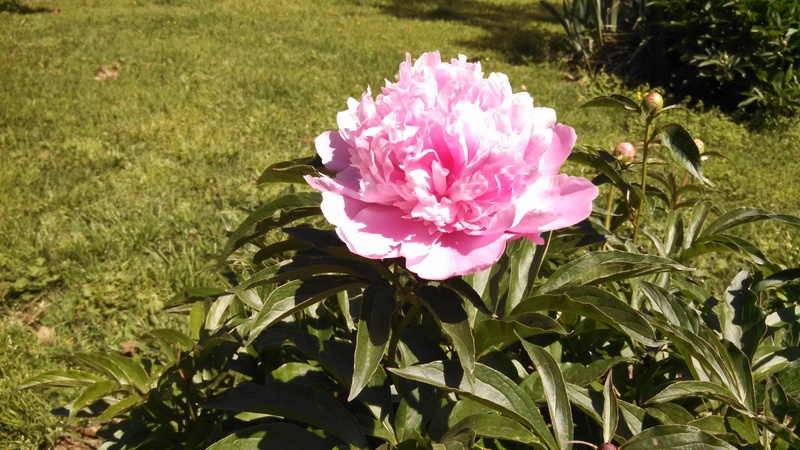 We also have several peony plants that give us these beauties in multiple shades of pink. The start out very deep pink and slowly fade to a soft, almost white pink. Spring is also a time of heavy yard work. While most of the property is left to its own devices, we do keep a large area around the house mowed and some trails mowed down to the ponds for easier walking. 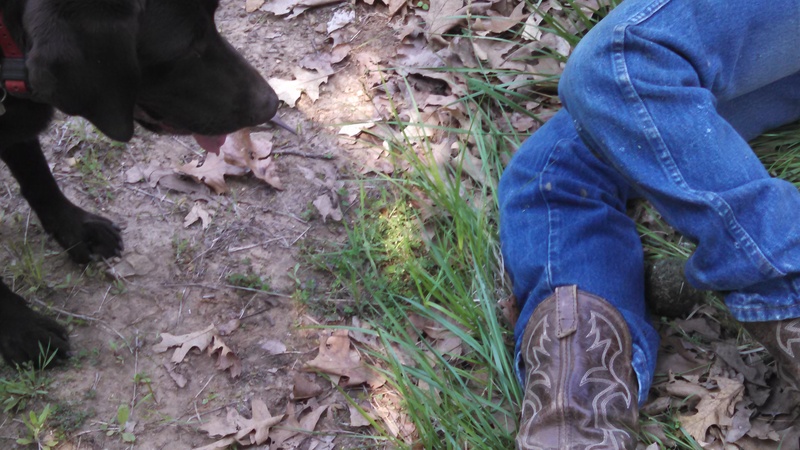 During our first Spring here, we discovered many tree stumps and rocks in these areas. With the mower blades. 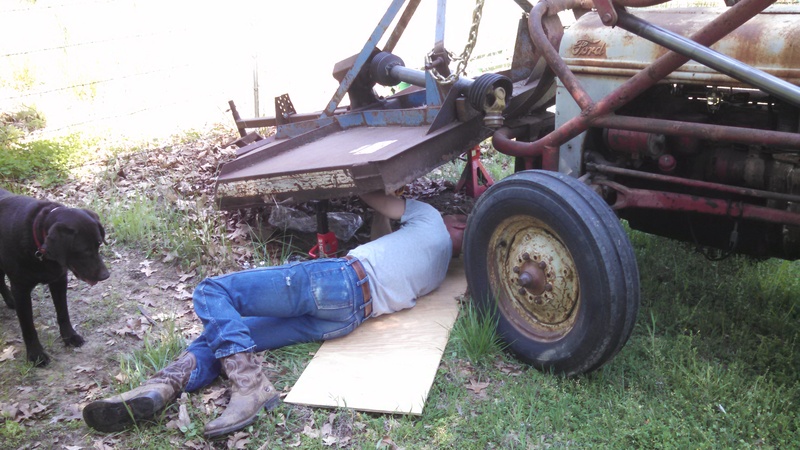 On the riding mower and the tractor shredder. So they were in desperate need of attention. 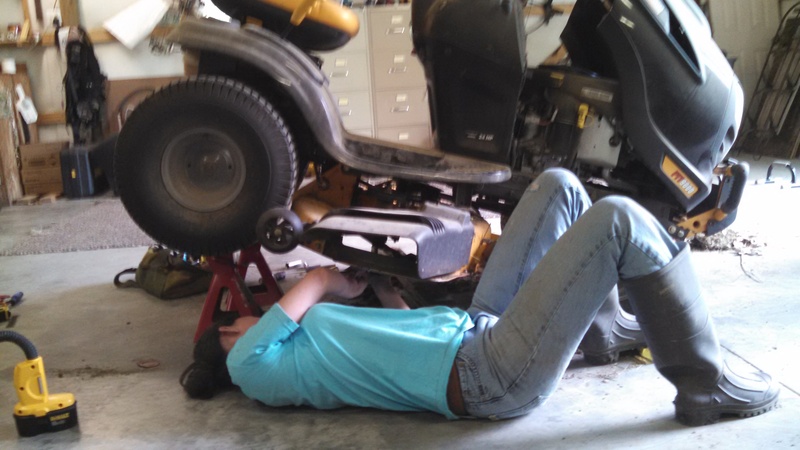 This means pulling the mower into the shop, climbing under, and removing the blades. 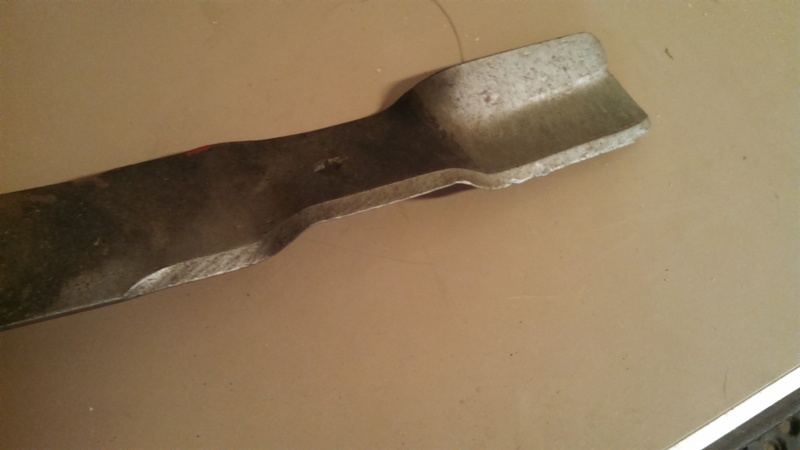 I volunteered to take the second blade off my mower after watching CAT with the first one. 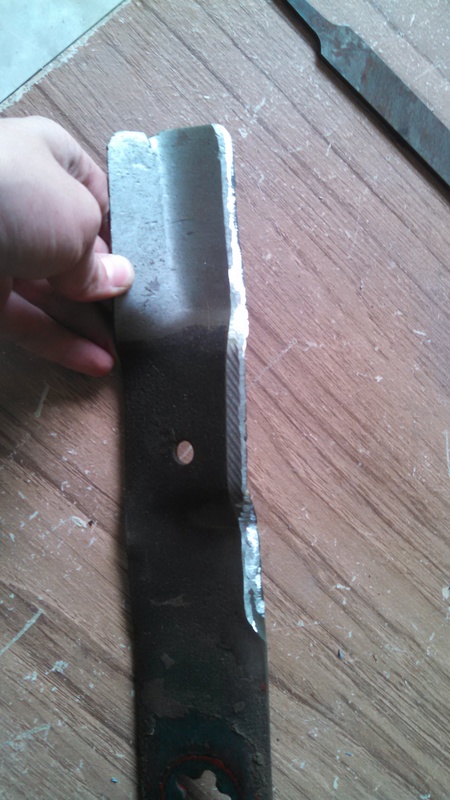 The blades were in rough shape. Dull and lots of dings from hitting tree stumps and rocks. I’ve since marked the stumps so I can avoid them in the future. CAT went to work with the grinder to get them cleaned up and ready for some much needed mowing. While they will get us through this season, we’ll be buying new blades for my little mower next year. Then CAT went to work on the shredder. He uses this to maintain our field in the river bottom and to keep some nice walking paths for his lovely wife to use to go fishing at the ponds. This exercise involves using the tractor to lift up the shredder and bracing it on floor jacks to keep it from falling. Tank is helping. To be clear, Tank helping involves dropping a tennis ball at CAT’s feet and hoping it will get thrown. 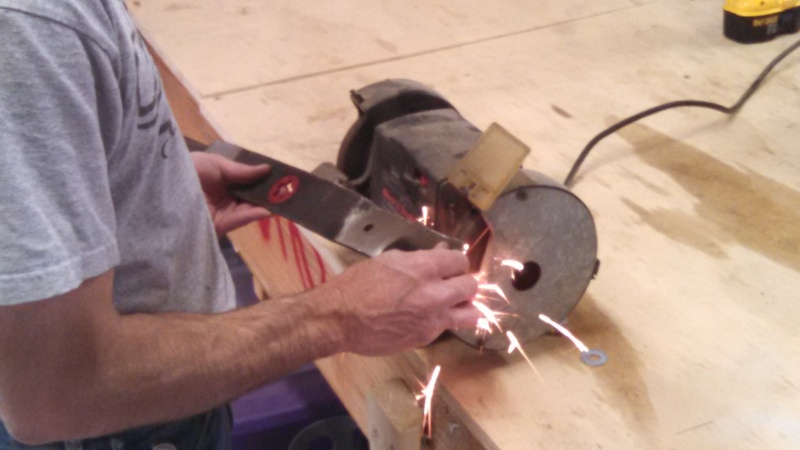 The shredder didn’t really need sharpening since the tool relies more on speed of the blades and less on sharp edges. CAT made sure the blade arms were loosened up, cleaned some of the grit and build-up out of there, and called it good. 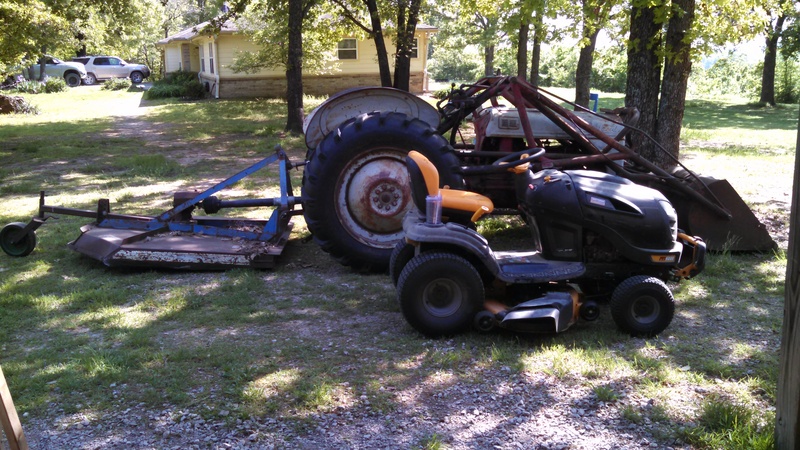 His and hers mowing equipment. No, we are not a normal couple–no monogrammed towels here.